Even though the final season of Game of Thrones is postponed until 2019, states are still Googling it. 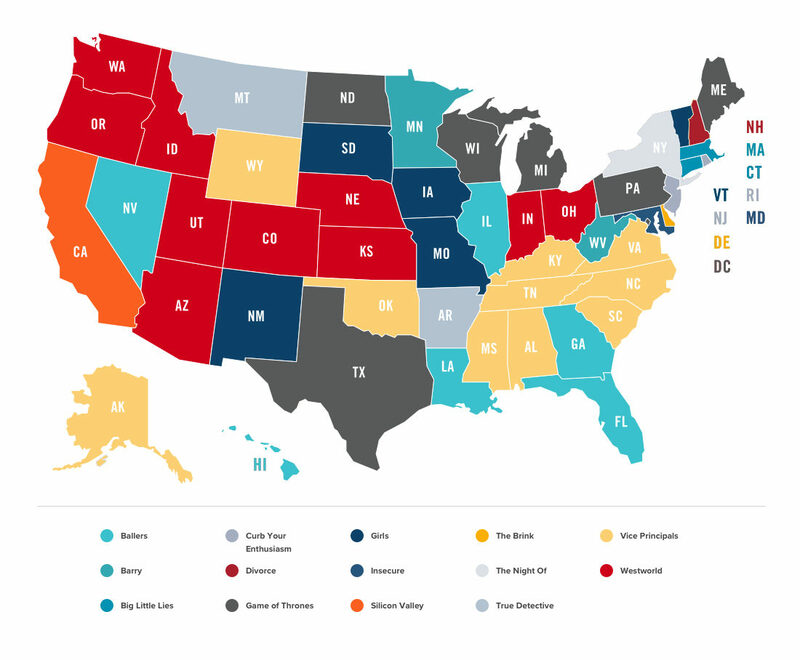 That got us curious: what other HBO® shows can states not stop Googling? Does that question sound familiar to you? Yes! Last year we analyzed each state’s most popular HBO original series with some interesting results. This time, we narrowed our research to current or recent original scripted series, and took the 20 shows with the most viewers. We then turned to Google Trends from March 2017 to March 2018 to quantify the search volume around each series. Like before, we found some interesting data! Surprise. Surprise. People love searching for shows that somehow relate to where they live! South Carolina searched more than any other state for the HBO show Vice Principals, which is filmed in various locations throughout the state, including Charleston. Ballers, set in Miami, is searched most by those living in Florida. Like 2016, Californians searched the most for Silicon Valley, and Colorado and Washington state searched for Westworld. Perhaps Westworld will become popular in more states as people tune in to fill the gap until Game of Thrones airs in 2019. Washington, D.C., is home to the biggest fans of HBO. People there searched more than any of the 50 states for HBO shows, specifically Game of Thrones, Ballers, Insecure, Big Little Lies, The Leftovers, The Deuce, and Veep. While Veep makes the most sense, the variety suggests Washington, D.C. likes shows with strong characters and a good story. New Yorkers searched the most for The Night Of, Curb Your Enthusiasm, Barry, Divorce, and Crashing. Each show takes place in or around New York, and covers all the bases of drama and comedy. What’s Your States Most Searched HBO Show? Find your HBO Bundle Today!